Critically acclaimed International artist Michael Belmore’s ( Ojibway) works are meditative reflections on the re-emergence of species and the growing presence of wildlife in suburban and urban areas that are challenging contemporary understandings of nature and the wild. The roadkill remains of a deer represented in Michael Belmore’s Boundless is complemented by a selection of contextual charcoal drawings that reflect this profound encounter between human and animal. Belmore, a member of the Royal Canadian Academy of Arts, was born in 1971 north of Thunder Bay, Ontario. 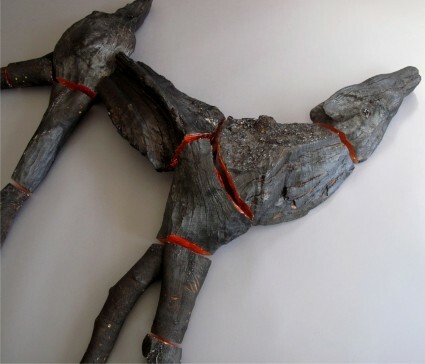 Belmore’s work has warranted numerous awards/grants from the Ontario Arts Council, Canada Council, and Canadian Native Arts Foundation and has shown extensively throughout Canada and Internationally, Belmore is represented in the permanent collections of various institutions and private collections. Join us for a Gala Opening Reception at Definitely Superior Art Gallery Sat.Apr.9 @7-11pm with three new exhibitions featuring national/international artists-part of the downtown wide Urban Infill exhibitions and a ferocity of Art-Music/Dance /Wearable Art and New Media Performances-catered refreshments. Pick up your map at DefSup and then follow the Tour Guides to all the exciting Urban Infill locations. Open Apr.10-Apr.12 (12-6pm) + Continues to May 7.